Put chicken in a re-sealable plastic bag. Pour ½ cup salad dressing over chicken; seal bag and let sit at room temperature for no longer than 30 minutes (or refrigerate overnight). Preheat barbecue or indoor grill. Grill chicken breasts until the meat thermometer inserted into the thickest piece reads 170F. Remove from heat and let stand. Cook tortellini in boiling water for about 8 minutes. It should still be firm (“al dente”). Drain, rinse, and drain again. 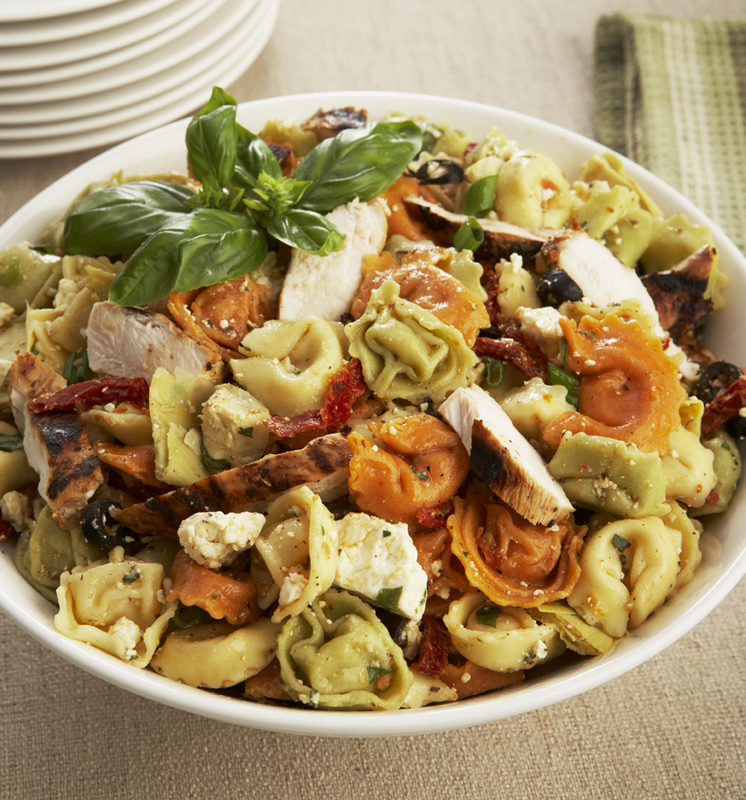 In a large bowl combine cooked tortellini, olives, sun dried tomatoes, Feta, fresh herbs and green onions. Tear artichoke hearts into bite size pieces and add to tortellini. Slice chicken breasts; add to tortellini. Pour remaining salad dressing over tortellini; toss till well mixed. Serve warm or cold. Flavours will intensify if the salad in made a day in advance and refrigerated till ready to serve. Keeps up to 3 days in the fridge.